Teacher Sandra Burke with Pauline Connolly and Tony Murphy and pupils who worked on the Milltown Heritage Project. MILLTOWN National School are making good use of the 20 Chromebooks they recently bought that assist pupils continue their learning in the field of technology. At the school, where 97 pupils are currently being taught, there is a keen emphasis placed on the STEM subjects of Science, Technology, Engineering and Maths, and the Chromebooks come in handy when topics need to be researched, and when doing maths online through the Khan Academy. A number of plaques for STEM excellence have been given to the school through the Discover Primary Science and Maths awards in recent times. “We ran the Milltown Maths league last year for six weeks in the run up to Easter. 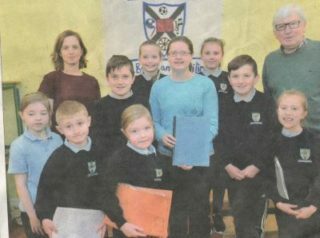 The fourth, fifth and sixth class kids stayed on for an hour after school some evenings to take part,” said Neala McWalters, teacher of third and fourth class, who also acts as a science facilitator in Milltown NS. The school are lucky to have a very active Parents Association, according to Principal Tom Casby. The parents helped out when it came to acquiring the Chromebooks, and especially so when the pitch at the back of the school needed to be redeveloped. “The area was basically a swamp before, and the Parents Association raised €8,000 for the project. The field was drained and seeded, and they’re now giving us €1,000 towards playing equipment that we can use for it. They’ve been fantastic,“ said Mr Casby. Milltown Heritage Group members Tony Murphy and Pauline Connolly were in the primary school last week to be presented with stories that children from the school had researched about food-related topics from different aspects of Irish life down through the years. The children gathered stories to do with ration books and potato picking, amongst others, from their parents, grandparents, uncles and aunts. It was all done as part of the Galway Gastronomy History Project, a website launched in the past few months displaying information on the gastronomic history of the local region. In 2018, Galway will serve its term as a European Region of Gastronomy. The school have an Active Flag, and duly have an Active Week each year. A new sport which has been introduced since September, to go along with Gaelic football and hurling, is volleyball. Orla Donohue introduced the children in her fifth and sixth classes to the sport, and the class was divided up into teams of six for a league that was set up. Ms Donohue now referees games at lunchtime in the school’s multipurpose hall. There are 25 children in junior and senior infants, and Aistear is a means to both keep them active and help them learn in a fun and engaging manner on a daily basis. The children frequently use ipads when doing Aistear, and also get movement breaks that assist in the learning process, as they eagerly count down the days before Santy arrives. Senior infants take themselves to Milltown National School’s library, where they pair up with children in fourth class for the popular Buddy Reading programme.